Last week in Los Angeles, producer Natalie Portman and director Christopher Quinn discussed the issues raised in Eating Animals following an awards screening hosted by the International Documentary Association. How much do you know about the food that’s on your plate? 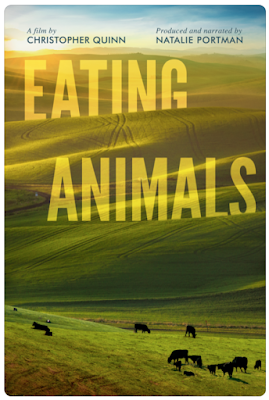 "Eating Animals" is an urgent, eye-opening look at the environmental, economic, and public health consequences of factory farming. Tracing the history of food production in the United States, the film charts how farming has gone from local and sustainable to a corporate Frankenstein monster that offers cheap eggs, meat and dairy at a steep cost: the exploitation of animals; the risky use of antibiotics and hormones; and the pollution of our air, soil and water. Spotlighting the hero farmers and whistleblowers who have faced intimidation to stand up for what they believe is right, "Eating Animals" offers attainable, common sense solutions to a growing crisis while making the case that ethical farming is not only an animal welfare issue but one that affects every aspect of our lives.